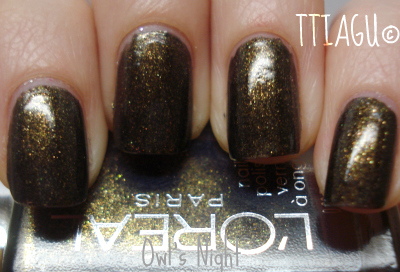 Owl’s Night was one difficult polish to find. You would think living in NYC it would be easier to find things. 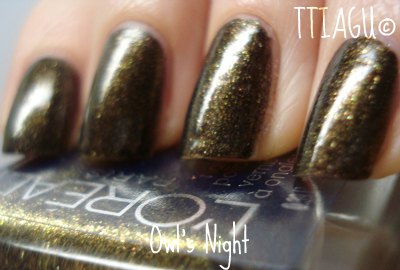 Nope, too many people and not enough product, but finally, I found L’Oreal’s Owl’s Night after several weeks of stalking the local drugstores. The Application: I have never used L’Oreal nail polish before, but I was impressed. The formula was easy to use and smooth like butter. It took two coats to become fully opaque. The Color: This one is a bit hard to describe. It’s a goldish, brown, olive color with a hint of metallic goodness. It’s glittery without the huge chunks of glitter that always make me cringe when it comes time for removal. It really is a fun polish with a lot of depth which I hate to say surprised me for L’Oreal. Maybe I need to give more credit to drugstore polish in the future. The Verdict: Yep, I like it! 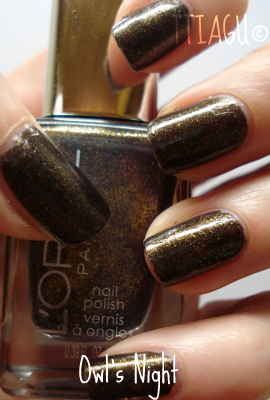 This is a great, dark polish that’s perfect for fall or winter. It’s an interesting polish with a lot of character and one that got a lot of attention throughout the week. Thanks to a lot of typing in my life now days, most of my polishes haven’t been lasting more than 2-3 days, but Owl’s Night lasted a good 3 days before I had to change it for another color. Owl’s Night is limited edition so get yours quickly if you can find it. It’s totally worth it!